The fifth album from Germany's most charming and relentlessly melodic strong man is here! Aficionados of the musclebound titan will most probably be aware of the fact that Rummelsnuff has actually been working as a team of super heroes for quite some time . hence, it is rather logical that his musical sidekick should also be featured in the album title, this time around. Captain Rummelsnuff and mate Asbach, the dynamic duo of raw electrified sounds (as defined in the German term "derbe Strommusik"), are singing of the burdens of hard labor ("Treidler", "Strassenbau"), about human cattle being fattened up with that certain cheese from the German "Harz"-region that many locals consider an acquired taste, while Dr. Rummel is dancing with his arch nemesis Mr. Snuff to an unexpectedly funky tune: On "Rummelsnuff & Asbach", no song follows the same stylistic traits as its predecessor, yet everything always remains thoroughly infused with Rummelsnuff's trademark sound. Electro-Punk, grand melodies, Folk, Disco, maritime songs... just about anything goes! 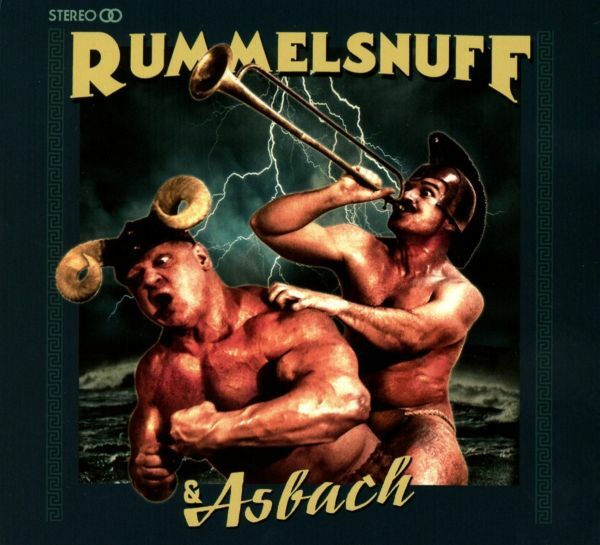 Rummelsnuff, the ancient bodybuilder with the rusty dumbbells and Asbach, tenor baritone and offspring of a famous dynasty of German liquor distillers, are taking wide strides towards perfection... while cautiously avoiding it by any means.